Planet Beach Entry Boxes - Pre-Sale/Limited Time. We'll add your clubs info. 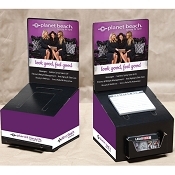 Planet Beach Pre-Sale Entry Box Package for Locations outside of LA Fitness. This package has everything you need to start a successful lead box program! The designs are created and approved by Planet Beach Corporate. Slight modifications are allowed depending on the box style selected. Your club address will be added to the box. We will use the address that is shown in the shipping area if not specified in customer instructions. 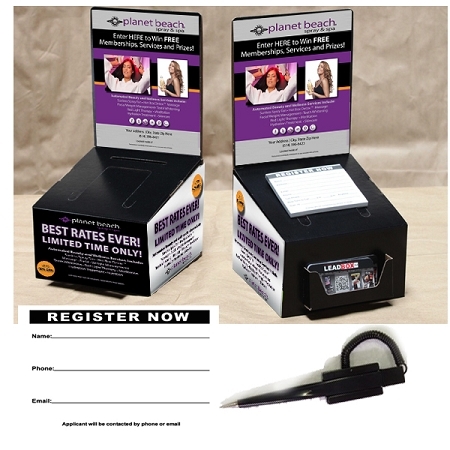 Package Includes, (20 BLACK CARDBOARD BALLOT BOXES, (20) BUSINESS CARD POCKET ATTACHMENT (optional). (part #510),20 ARTWORK DECAL STICKERS (HEADER BOTTOM FRONT AND SIDES), 20 (702) PENS, AND 25 SIMPLE REGISTRATION PADS (50 PER PAD).